A solidly-built, classy-sounding dirtbox with plenty of flexibility. 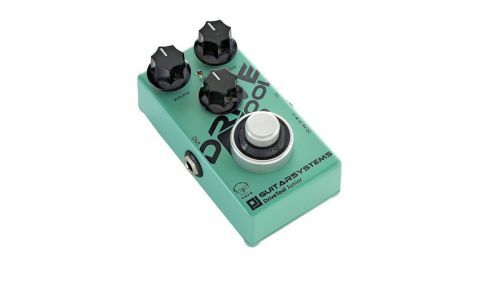 Despite it's Junior moniker, the DriveTool doesn't have an equivalent in GuitarSystems Standard range. It's an overdrive based on the Tube Sound Fuzz, designed by Craig Anderton, which was more a dynamic overdrive built on CMOS logic chips. "GuitarSystems says its pedal, which uses NOS chips from 1982, has a tight frequency response, more like a Klon Centaur"
Way Huge used this principle for its original Red Llama, but GuitarSystems says its pedal, which uses NOS chips from 1982, has a tighter frequency response, more like a Klon Centaur. You get a nice transparent overdrive that's responsive to string attack, and cleans up with guitar volume. The range goes from a gritty boost for your amp to a sound like a cranked tweed Fender. The TMF (Treble Mid Full) knob helps reduce treble so the overdrive won't get too shrill with certain amps - rolling it back a touch created a natural- sounding match for our bright 10-inch- speaker-equipped Fender. A rewarding choice if you're looking for responsive natural overdrive to match your amp.